Faulty computer software could have led to a Chinook helicopter crash that killed 25 of Britain’s top intelligence experts, it was reported today. An internal Ministry of Defence document written nine months before the 1994 crash and obtained by the BBC said the software was “positively dangerous”. Written by experts working for the MoD’s aircraft testing centre at Boscombe Down, it shows there were serious concerns about the engine control computer software, the BBC claimed. Deficiencies meant the pilot’s full control of the engines “could not be assured”, said the report for Radio 4’s Today programme. 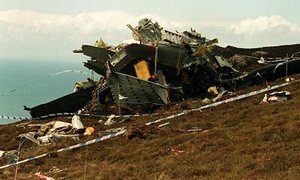 The crash on the Mull of Kintyre in thick fog on 2 June killed 29 people including more than 20 senior members of Northern Ireland’s military and intelligence community. Their deaths were described at the time as a “catastrophic loss in the fight against terrorism”. An official RAF inquiry concluded the aircraft was airworthy and found the two pilots guilty of gross negligence. But three inquiries since have found that the cause of the crash was inconclusive. Campaigners and relatives of those killed have always insisted that flaws in the Mark 2 helicopter were likely to have caused the crash and not the negligence of the pilots. They believe the aircraft was rushed into service and the pilots, Flight Lieutenants Jonathan Tapper and Rick Cook, were blamed to save face. The MoD said the Chinook crashed in poor visibility and the fleet had a safe and successful service history. In a statement it said: “Ministers have repeatedly stated that they would reopen the board of inquiry if any new evidence is raised. “Despite numerous representations over the years, nothing has been presented to successive secretaries of state that would justify reopening the inquiry.